Around the holidays, potlucks are never ending! It can make you feel like you’re overeating too much, and I hate that bloated feeling. That’s why this year, I chose Michelob ULTRA over wine. A glass of Michelob ULTRA has 60% less carbs and 20% less calories than a glass of wine! 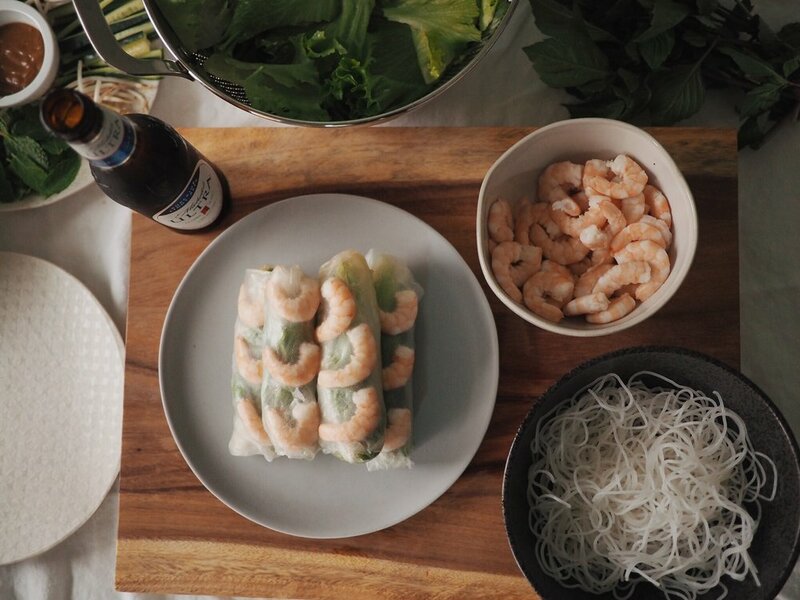 To take it even further, I thought I’d share a recipe that’s best paired with this light beer: Vietnamese shrimp spring rolls. The peanut sauce is super easy to make: take all of the ingredients and whisk them together in a small bowl. This is your dipping sauce for the rolls later! Fill a large bowl or shallow plate with water and then wet the rice paper. You only need to wet it for 1-2 seconds for it to start getting soft. 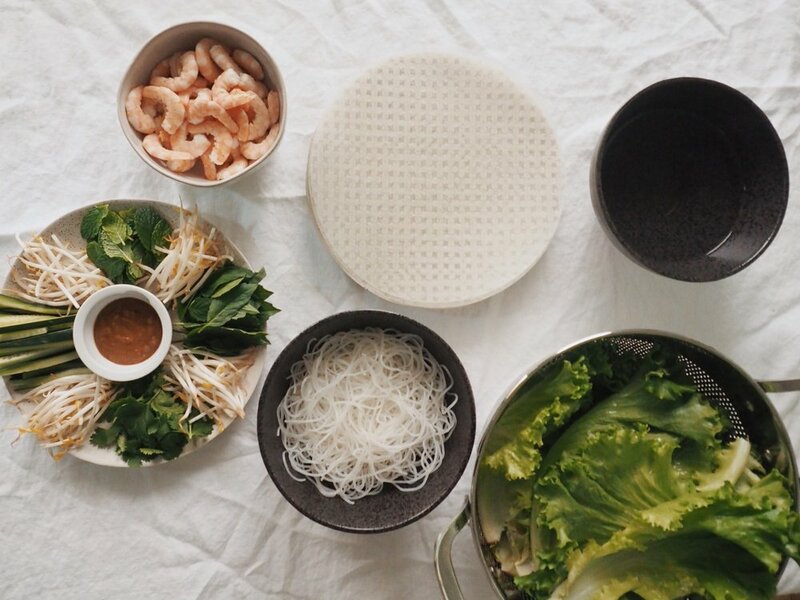 Lay this down to start building your spring roll. Put the lettuce down first. Then you can start adding in the noodles and other veggies. Save the shrimp for last! They go up top, spaced above the lettuce. You’ll see why in the next step. Now comes the fun part! Start by rolling from the bottom up, and roll all the way up to the lettuce. Fold the edges in and then continue rolling, including the shrimp. This is for presentation purposes: the shrimp will sit nicely above everything else! Watch below to see how to roll! All done! There you have it - a simple, easy, and healthy dish to bring to potlucks and pair with a light Michelob ULTRA! Enjoy! I’d like to dedicate this post to my beautiful bridesmaids. There isn’t anything I wouldn’t do for these girls, and they made me feel the same throughout all of my planning, bachelorette party, and wedding day. Throughout the day, they had been documenting me getting ready with a Fujifilm instant camera. They had created this book ahead of time filled with their letters to me about our friendships together. All morning, they were sneakily taping the photos they were taking into this book… including a photo they had taken of my mother, my sister, and me not even 5 minutes prior to handing me this gift! I can’t believe how much thought they put into everything! I will forever be grateful… and so begins my letters to them. My wonderful maid of honor! I’ve always said and will say again how great you are at handling the everyday things. You have the most common sense and practicality out of everyone I know. Even though I helped you with academics throughout college, you helped me with things a young adult should have already known, like how to boil an egg or fold clothes! Living with you during college was the reason I laughed the hardest throughout those years. You’re so silly, and we clicked so easily! That’s probably why I was so excited to live with you yet again when we were in our late twenties! You will always be a friend I will cherish throughout life. Thank you for taking on the stress and challenges of being my maid of honor, even though you had to help with a ton of other weddings, showers, birthdays, family matters, and more. You are superwoman, and I hope I can do as much for you that you have done for me! Roomies for life! My baby sister! We’re finally both married women! I loved being part of your special day, and I’m glad you were able to be part of mine. Thank you SO much for taking care of the family side of things, fighting some of my battles, and listening to me vent. You always reassure me when I only have criticism for myself, and you keep me sane! I could not have done it without you. Even though I’m the older one, I feel like you’ve lived a lot more life than me, and I applaud how you handle every situation that’s been thrown at you. Thank you for being so generous, kind, and thoughtful to me. I’m lucky to be able to tell people that I’m actually close to my sister, and that we’re just alike when it comes to the core. I can’t wait until Ashton has a little cousin to play with, and we start our own family traditions together. My fellow crazy cat lady! Thank you for coming along on this journey with me! I know you had to sometimes step out of your comfort zone for me, and I truly felt special that you would do that for me. Even though we don’t see each other a ton, and we lived relatively far from each other all the time, I love that you make time for me when you can. You’re one of the most down-to-earth, candid, no BS girls I know. Not to mention you have impeccable taste in music, art, fashion, and books. Thank you for randomly surprising me with books, photos, and inspiration! Few people have influenced me in life, but having you as my friend definitely steered my towards certain taste and aesthetics over the years. I’m so glad to have you in my friends circle. It was so funny how we discovered how alike we were in college! There were so many situations where I felt alone until I talked to you. I appreciate how honest you are and how you go to such great lengths to be a good friend. Because of you, I’ve learned to say yes to more social situations LOL. Even though you and I have lived in different cities, it never felt like you were far. Like even now, when you’re in Austin! We always pick up where we left off whether it’s through text or in person, and that doesn’t come easily to me! I love that you have a huge heart, think to put others first, and are always there when I need advice. You are someone who shows friendship with action and not just words, which is something that can be so rare these days. I’m so lucky to have you as my friend and as a bridesmaid! I can’t wait to see you again in January! My History Day, MST Day, multimedia capstone, piano, travel, and everything partner! Wow, we’ve been through SO much together! Thank you for being down to be my bridesmaid and to always hang out with me, be creative with me, and inspire me! You are crazy talented and push me to be better in so many ways! As a left-brained person who loves creativity, I find it to so fun and refreshing to be around an actual right-brained person. You’re such a great friend and an independent and driven person. I can’t wait to see where your future takes you, and I will always be there to cheer you on! My wonderfully talented, outgoing, bubbly, and hilarious friend! You’ve always been so easy to talk to, and I’m so glad to have gotten close to you throughout college. I love how you always make the effort to get people together or make everyone feel special, whether it’s a birthday, engagement, or any other celebration. You selflessly pour a ton of heart and energy into others, including me, and I don’t know how to repay you! Thank you for being my bridesmaid, making “special” cookies for my bachelorette, and making time for me when I visited California! I miss you and selfishly hope that you’ll be back in Texas for good so I can see you more often again! I’m so excited for your special day too, and I hope I can help you as much as you helped me! Thank you again to Watters for having my girls’ backs like they had mine! They were the perfect dresses for the perfect bridal party. This is a sponsored conversation written by me on behalf of Zenni. The opinions and text are all mine. I don’t know about you guys, but my optometrist visits are in late November/December. Yep, right around the holidays. And once in awhile, I like to splurge on some eyeglasses! It used to put a dent in my wallet too… but now, I’m so glad I’ve discovered Zenni! Their eyeglasses are some of the most affordable I’ve come across, AND they’re super stylish! Ordering from Zenni was so easy, especially since they have a Try On Tool! For my first frames, I got the tortoiseshell Laze. I’ve had a similar frame shape before and wanted to go with something more familiar, but I thought I’d branch out and actually get a pattern on the tips. It went perfectly with one of my cozy fall outfits! For my second pair of glasses, I went with a shape I had never tried before… square! I LOVE this style so much! I absolutely love the gold rims and matte black wire detail on the brow! It adds that bit of sharpness to outfits! Not to mention, they’re super comfortable! If you’re looking for your next pair of glasses, I highly recommend heading to Zenni for stylish, affordable, and high-quality eyewear.